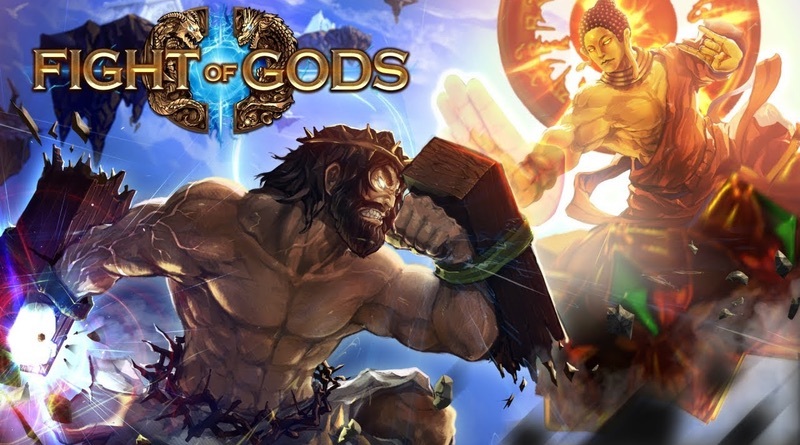 Fight of Gods is a game most well known for its controversies rather than the merits of the game itself. It’s a fighting game about multiple religious figures, like Jesus, duking it out in a fictional setting, so of course you’re going to get banned from being sold in a few countries. It does say something about the way Nintendo has progressed as a company to allow a highly contentious game like this one onto the Switch eShop. 30 years ago they wouldn’t even allow crosses in their games! Other than be controversial for the case of being controversial, are there any redeeming qualities for this fighter? Not so much! Like all great crossovers, the most important aspect is the lineup of fighters. The roster is full of fan-favorite characters like Zeus, Santa Claus, Anubis, and of course Jesus. That being said, there are a ton of other characters that could have been included to bolster the lineup. Many of these fighters have appeared in games before, so really the novelty factor isn’t as impressive as it could have been. If you’re going to create a game with these characters, the least you could do is make it entertaining. The concept really isn’t utilized nearly as well as it could have been. There’s virtually no interaction between the various fighters, which could have resulted in some hilarious dialog. Sure the stages are based on religious locations, but that’s not enough to sell the idea. More needed to be done to really capitalize on something like this, and it all just feels like wasted potential. While the roster is important, what ultimately matters in a fighting game is how it plays, and Fight of Gods plays all right for a fighting game. There are no delays to button inputs and the characters movements don’t feel floaty. While it is simple enough for a starter player to get into, it does expect you to learn all of the button and joystick combinations you would expect from fighting games. Each character has their own move sets, though some do borrow moves from one another, so learning their attacks and effects will become necessary in order to win. One of the bigger downsides of the game is the lack of polish. The fighters are non-expressive, keeping the same face animations during the fight. Characters’ attack animations can look choppy at times and are not consistent with their movement. Stages look very bare bones with no real interesting visuals going on. While everything is passable, all of these minor annoyances add up and create a less than ideal visual identity. The game does have a decent amount of content when you consider the $12.99 price point. There is a VS mode as well as a training mode, though the main time sink for this game is the single player arcade mode. A small story does accompany this mode, but it’s pretty cookie cutter and forced to the point where it’s not the last bit interesting. You can unlock alternative costumes here, which might have been a nice incentive to complete the game several times if they had been exciting. They’re not. While the amount of content is standard for a fighting game, the quality of that content is what hinders its lasting appeal. Bland repetitive character intros, choppy animations, lackluster stage designs, and a boring story make for an underwhelming experience. The game is riddled with so many flaws that the enjoyment you had through your first playthrough will die down quickly. There’s only so many times you can play the same bland stages with the same unexpressive characters before you just get tired of the game as a whole. With a host of better alternatives for fighting games on the Switch, this one can easily be passed up. Fight of Gods is your standard fighting game with a lot of wasted potential. Character animations are choppy and unexpressive, the stages are blandly designed, and the quality of it all is severely lackluster for a crossover this big. The only praise from this game is having ok controls and a neat premise. If that were not enough to grab your attention, then it would be best for you to back out of this fight.